TKF is installing two monuments near Izyaslav to honor the Holocaust victims and to ensure that the horrors of the Holocaust are not forgotten. 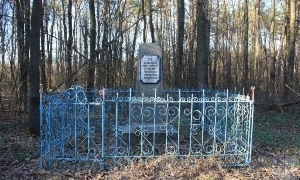 The first monument was opened on October 25 at the forest near village Soshne, located 7 km from Izyaslav. Over 2,000 Jews from Izyaslav and the surrounding areas were killed at this site. “The sculpture is an attempt to express the conflict of chaos and harmony, to understand that harmony is effort and work. And chaos is the surrender to the Beast. The lower, roughly perforated part of the obelisk is in the zone of chaos. The upper symbolizes harmony and the victory of the mind”. Small obelisk was installed by Jews of lzyaslav on this mass grave site after the war. 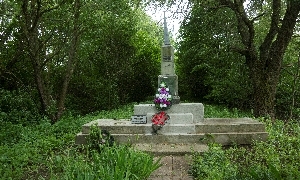 The inscription on the obelisk said: “To the victims of Fascism- 1942-1943”. A small memorial pluck with the name «Жебровская Роза Семеновна» is attached to a step of the obelisk. 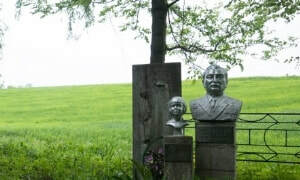 The Soshne killing site contains also two commemorative sculptures telling the story of one family torn apart by the murders at Izyaslav. The sculpture of a girl commemorates the short life of Svetlana Korostiy (Коростий), who was born on March 31, 1938 and killed by policemen in September 1943. TKF plans to install the second monument, identical to the first, in spring 2019 on the site of first mass killing of Jews in Izyaslav on August 30, 1941. That site is located in Poboy, western outskirts of Izyaslav, where ant-tank caponiers were built before the war. On that day, about 1000 Jews were murdered in Poboy caponiers. war. The inscription on the monument said: “Here are buried innocent residents of the town of Izyaslav who were shot to deathby the German Fascists in 1941”.